Item # 310079 Stash Points: 4,499 (?) This is the number of points you get in The Zumiez Stash for purchasing this item. Stash points are redeemable for exclusive rewards only available to Zumiez Stash members. To redeem your points check out the rewards catalog on thestash.zumiez.com. Slay the streets like Jake Hayes on the Deathwish Jake Hayes Kenga Woo 8.0" Skateboard Deck. This medium concave deck features a traditional popsicle shape and kick tails that taper down quickly to cut weight. A thinner more upturned nose maximizes nollie tricks while the wider and larger tail really powers ollies. 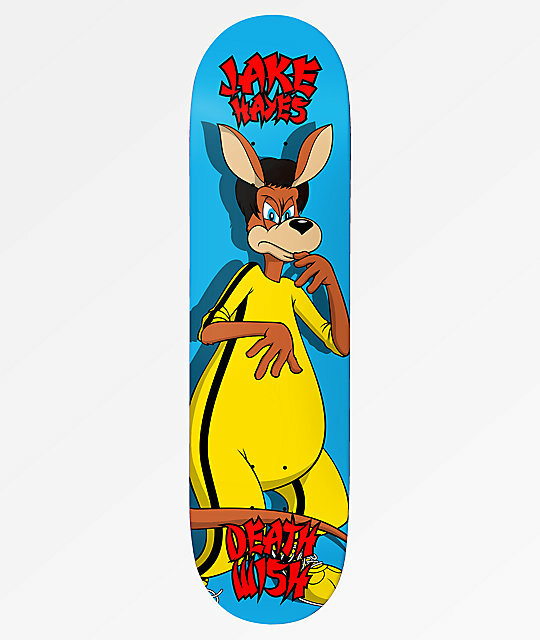 Get a great all around ride from a street centralized design and the Deathwish Jake Hayes Kenga Woo 8.0" Skateboard Deck. Jake Hayes Kenga Woo 8.0" Skateboard Deck by Deathwish. Signature Jake Hayes pro model.